Toe-tapping, theatre buffs, there is cause for celebration - the Tony award winning show, Jersey Boys, is back in Melbourne. With an overwhelmingly cool and infectious soundtrack, Jersey Boys follows the success of the American boy band 'The Four Seasons' and their catapult to stardom. Frankie Valli, Bob Gaudio, Tommy DeVito and Nick Mass, devised a stylistic sound and look that will be remembered for generations to come. Their story is fascinating, a far cry from the pretty boy image that holistically surrounds the boy band counterparts of the time, namely The Beatles and The Beach Boys. Frankie Valli and The Four Seasons came from working class backgrounds, with band member, Nick DeVito even leaving to serve a jail term! Hardly the stuff of a squeaky clean boy band image. Promotion for the band as consequence fell by the wayside, but their compelling story no longer remains a mystery. Jersey Boys will exceed all of your expectations plus more. Enjoy the acapella sounds of their hit songs such as 'Sherry', 'Can't Take My Eyes Off You' and 'Oh What a Night'. 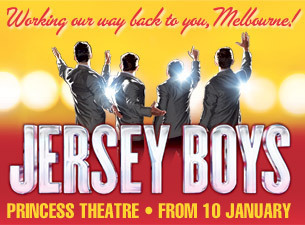 Jersey Boys returns to Melbourne for a strictly limited season from 10 January 2013. For further details and to book tickets, please click here. Why? Jersey Boys is back in Melbourne. When: Strictly limited season from 10 January 2013.